Charlie Chaplin was a famous Actor from England, who lived between April 16, 1889 and December 25, 1977. He became 88 years old. Sir Charles Spencer "Charlie" Chaplin (born in Walworth, London, England, United Kingdom, died in Vevey, Switzerland) was an English comedian, actor and film director in the silent film period. He was one of the most famous movie stars by the end of WWI. 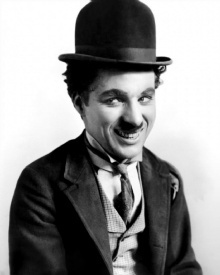 Chaplin used mime, slapstick and other visual comedy with a certain sense of what was funny. He continued well into the audio file while age, but his films were more rarely from the late 1920's. His most famous role was as the Tramp, which he first performed in the film company Keystone Studios' film Kid Auto Races at Venice in 1914. From April of that year, with enrullsfilmen Twenty Minutes of Love onwards, he wrote and directed himself most of his films. From 1916 he was also a producer, and in 1918 he composed music as well. Together with Mary Pickford, Douglas Fairbanks and DW Griffith, he was co-founded film company United Artists in 1919. Chaplin was one of the most creative and influential personalities in the silent period. He was inspired by the French silent movie comedian Max Linder, which he dedicated one of his movies to. Chaplin's career in entertainment spanned over 75 years, from the Victorian era and varietéer in England as a child performer until 1970, shortly before he died at the age of 88 years. His high-profile public and private life consisted of both excessive flattery and the strife. During the McCarthy era in the early 1950s forced Chaplin's association with leftist and his freedom of thought him to leave the United States and settle in Europe. In 1999, rated the American Film Institute Chaplin as the 10th biggest male movie legend of all time. In 2008, Martin Sieff wrote in a review of the book Chaplin: A Life, written by the psychoanalyst Stephen M. Weissman: "Chaplin was not only" great "he was enormous. In 1915 he broke out into a world torn by war to give away the gift of comedy, laughter and relief while the world was torn apart in the first world war. Over the next 25 years, through the Great Depression and the rise of Adolf Hitler, he stayed on the job ... It is doubtful whether anyone else has ever given more entertainment, pleasure and relief to so many people when they needed it most. "George Bernard Shaw called Chaplin of" the only genius that the film industry has brought forth. " Our collection contains 40 quotes who is written / told by Charlie, under the main topic Men. "The saddest thing I can imagine is to get used to luxury"
"The hate of men will pass, and dictators die, and the power they took from the people will return to the people. And so long as men die, liberty will never perish"
"We all want to help one another. Human beings are like that. We want to live by each other's happiness, not by each other's misery"
"What do you want a meaning for? Life is a desire, not a meaning"
"The glamour of it all! New York! America!" "To help a friend in need is easy, but to give him your time is not always opportune"
"We might as well die as to go on living like this"
"I went into the business for the money, and the art grew out of it. If people are disillusioned by that remark, I can't help it. It's the truth"
"I thought I would dress in baggy pants, big shoes, a cane and a derby hat. everything a contradiction: the pants baggy, the coat tight, the hat small and the shoes large"
"I suppose that's one of the ironies of life doing the wrong thing at the right moment"
"I remain just one thing, and one thing only, and that is a clown. It places me on a far higher plane than any politician"
"I have no further use for America. I wouldn't go back there if Jesus Christ was President"
"I had no idea of the character. But the moment I was dressed, the clothes and the make-up made me feel the person he was. I began to know him, and by the time I walked onto the stage he was fully born"
"I don't believe that the public knows what it wants; this is the conclusion that I have drawn from my career"
"I do not have much patience with a thing of beauty that must be explained to be understood. If it does need additional interpretation by someone other than the creator, then I question whether it has fulfilled its purpose"
"I am for people. I can't help it"
"I am at peace with God. My conflict is with Man"
"Failure is unimportant. It takes courage to make a fool of yourself"
"Dictators free themselves, but they enslave the people"
"Despair is a narcotic. It lulls the mind into indifference"
"Brunettes are troublemakers. They're worse than the Jews"
"All my pictures are built around the idea of getting in trouble and so giving me the chance to be desperately serious in my attempt to appear as a normal little gentleman"
"Actors search for rejection. If they don't get it they reject themselves"
"A tramp, a gentleman, a poet, a dreamer, a lonely fellow, always hopeful of romance and adventure"
"A man's true character comes out when he's drunk"
"Words are cheap. The biggest thing you can say is 'elephant'"
"Why should poetry have to make sense?" "That is why, no matter how desperate the predicament is, I am always very much in earnest about clutching my cane, straightening my derby hat and fixing my tie, even though I have just landed on my head"
"Remember, you can always stoop and pick up nothing"
"Movies are a fad. Audiences really want to see live actors on a stage"
"Man as an individual is a genius. But men in the mass form the headless monster, a great, brutish idiot that goes where prodded"
"Life could be wonderful if people would leave you alone"
"Laughter is the tonic, the relief, the surcease for pain"
"In the end, everything is a gag"
"I'd sooner be called a successful crook than a destitute monarch"